It is my honor and pleasure to welcome you to the 14th Senior Staff Meeting of the Association of Pacific Rim Universities (APRU), here on the historic island of Mactan, Province of Cebu. It is here in Mactan where Portuguese explorer Ferdinand Magellan fell in battle in 1521 against the warriors of the island, led by Datu Lapu-Lapu. Cebu Province is also where the first seeds of Christianity were planted in the Philippines, and its capital, Cebu City, was the first capital of and is the oldest city in the country. Today, Cebu is one of the most developed provinces in the Philippines. Mactan Island itself is one of the major tourist destinations in Cebu Province. It offers some of the best diving, snorkeling, island hopping, jet-skiing, sailing, and cultural activities in the country. My reference to these interesting activities is an invitation for you to include a little fun during your stay in Mactan. I am glad to meet again with our colleagues from the leading universities of 17 member economies of the Asia-Pacific Economic Cooperation (APEC). As with the previous APRU Senior Staff Meetings, this meeting is convened to review the development and implementation of APRU initiatives and activities, and make recommendations to be presented at the next Annual Presidents Meeting. The participating senior staff will also have a chance to update one another on the latest developments in our respective universities. The last APRU Senior Staff Meeting, which was held in early September of last year at the University of Auckland, had discussions around the theme, International Impact and Advocacy: APRU’s Next Phase. That theme arose from the consensus developed by the APRU presidents at their Osaka meeting in June 2015 that APRU “could play a greater role in informing policy and championing global issues”—driven by the view of the university as an agent for global transformation. Gone are the days when our universities could afford to concern themselves only with domestic issues and local communities. In our globalized, knowledge-driven, and interconnected world, we have learned to accept that our outlook must become global while continuing to address local concerns. Our universities are at the crossroads of the flow of knowledge around the globe. So as centers for learning and research, they must have an international perspective and promote exchanges and collaborations that transcend geo-political boundaries. For the University of the Philippines, this country’s national university, internationalization is enshrined in no less than our Charter of 2008, which mandates us not only to serve as the country’s premier graduate and research university, but also as a regional and global university. 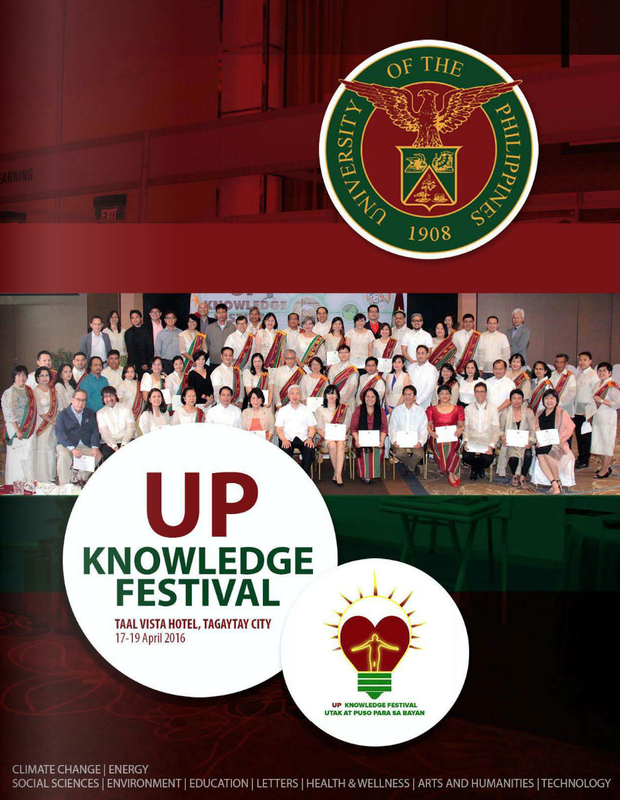 UP is a system consisting of seven constituent universities and a constituent college, the latter being UP Cebu which is based in Cebu City. The UP System has over 17 campuses, big and small, located across the country, together offering close to 200 undergraduate degree programs and more than 300 postgraduate degree programs. It has about 55,000 tertiary-level students of which 28 percent are postgraduate, more than 5,000 faculty members, and 8,700 support staff. Our flagship campus in Diliman has about 45 percent of the students. In light of our mandate, internationalization has been one of our major strategic initiatives, focusing on implementing projects and programs that help develop in our students and faculty an international outlook. All of our UP constituent units have pushed for regional and global competitiveness in their respective niche areas of expertise—for instance, IT and Creative Industrial Design for UP Cebu, Fisheries and Ocean Sciences for UP Visayas, Health Sciences in UP Manila, and Agriculture and Biotechnology in UP Los Banos, and so on. Our internationalization initiatives have taken on several directions—improving student mobility; promoting online education; and undergoing international quality assurance and accreditation of curricular offerings. Let me discuss some of these initiatives. Through our Office of International Linkages, headed by our Assistant Vice-President for Academic Affairs Dr. Rhodora Azanza under the office of Dr. Giselle Concepcion, Vice-President for Academic Affairs, we instituted the MOVE UP program (UP Mobility for Vigor and Excellence) beginning academic year 2012-13. This enables junior or senior undergraduates to study for one semester at a foreign university as exchange students. We provide the participating students with funding assistance to cover travel, lodging, and subistence costs fully or partially in accordance with our socialized tuition system. During the current academic year (2016-17), we expect around 300 students to participate in the MOVE UP program. The favorite destinations are Japan and Korea. But we are encouraging more students to go to universities in our neighboring ASEAN countries in support of regional integration. Another initiative is the COOPERATE Program (Continuous Operational and Outcomes-based Partnership for Excellence in Research and Academic Training Enhancement), under which postgraduate students at early thesis or dissertation proposal stage can undertake research or creative work at a foreign university. This program also supports UP research advisers who require a short-term visit to the student’s foreign co-adviser. We are providing travel grants and financial assistance to enable postgraduate students to present their research or creative work at an international conference. This started two years ago, and so far we have given travel grants to over 150 postgraduate students. We are now providing more travel grants to our faculty members for research dissemination through participation in international conferences. To provide even more of our faculty the opportunity to participate in international events, we now provide subsidy to encourage our various academic units to host in the Philippines an increasing number of international conferences, workshops and meetings. We are bringing into UP international professors and experts under our World Expert Lecture Series. Introduced two years ago, this program funds the travel of eminent world leaders in academe, government, or industry to the Philippines so they can give lectures in UP. Starting in 2015, the UP OIL and UP OVPAA are conducting roadshows in Europe, Australia, Japan and the US to entice our alumni who are now working in foreign universities to return to UP as faculty members through our Balik PhD program or as visiting professors. Alternatively, they are asked to host in their respective institutions the UP postgraduate students who plan to go for a sandwich program under our COOPERATE program. Several of our academic units now have such arrangements. Due to the nature of our mandate as a state-funded university, we have not done much to increase the number of foreign students enrolling in our undergraduate programs. The reason is simple. For every foreign student we take in, we would necessarily have to bump off one Filipino student because we have fixed admission quotas. However, we are working to increase the number of foreign students in our postgraduate programs, where there is more capacity and less competition from our local students. In terms of cross-border partnerships, we have partnered with foreign universities in order to provide innovative educational programs. One example is the Nagoya University-Asian Satellite Campus now hosted in UP Los Banos, which makes postgraduate programs of Nagoya University available to Filipino students without spending extended periods in Japan. Our UP Open University has forged a partnership with Southern Taiwan universities to offer continuing education to Filipino overseas workers in Taiwan. 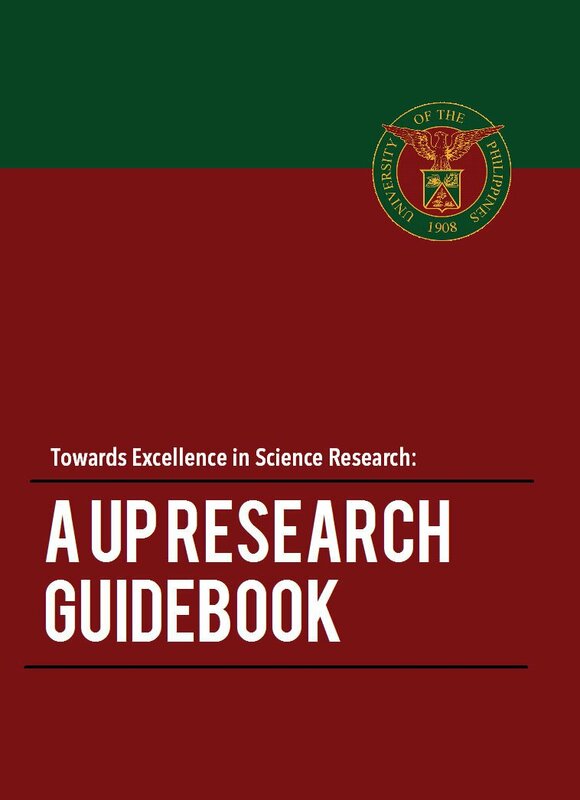 Other academic units of UP are also in discussions with these universities for academic exchanges in the areas of education, culture, industry, and agriculture. In terms of international linkages, we have existing relationships with almost 300 academic institutions in Asia, Australia, North America, Europe and Africa. It has been a continuing process of adding and weeding out. The arrangements cover student and faculty exchanges, dual degree programs, and/or research collaborations. We have launched university-wide research and networking hubs in partnership with other national and international organizations. One example is our Philippines Korea Research Center ([email protected]) established last year in partnership with the Academy of Korean Studies (AKS), whose main research agenda covers the areas of social sciences pertaining to Philippines-Korea relations. We have introduced the China/Strategic Studies Program also last year under the UP Center for Integrative and Development Studies. One set of activities is a lecture series aimed at promoting intellectual and civil society linkages between the Philippines and China in order to build mutual understanding and trust. Over the years, we have been very active in international networks and in forging partnerships with the global academe. Our affiliation with APRU and the ASEAN University Network (AUN) has become fruitful in terms of knowledge-sharing and securing UP’s place in the academic world map. We are also part of the ASEAN European Academic University Network (ASEA-UNINET), the South and Southeast Asia and Taiwan Universities (SATU), AsiaEngage, and the Asia-Talloires Network of Industry and Community Engaged Universities (ATNEU) for public service. We are a member of the Korean Studies Association of Southeast Asia (KoSASA), of which I am now president. 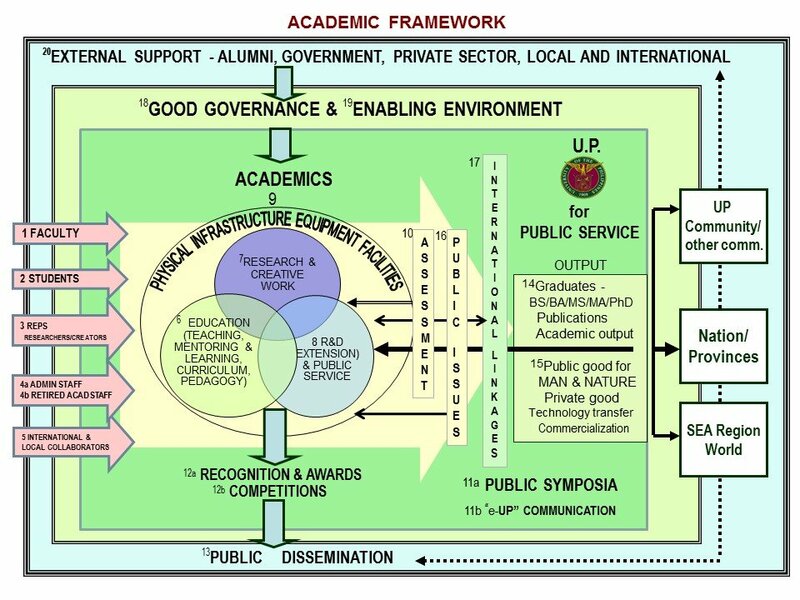 I have also served as a member of the steering committee of APRU and SATU, a testament to the increasingly active involvement of UP as a regional and global university. The vitality and success of our internationalization programs and initiatives have allowed us to grow to the point where our international activities have moved from mostly one-on-one partnerships between individual faculty members or units within UP and their counterparts in foreign universities, to strategic academic partnerships and research collaborations between UP and foreign institutions. I am proud to say that it is the competence and capability of our faculty, the continuing high caliber of their research and creative work, as well as the rich networks they have developed, that have facilitated our internationalization efforts. Due to the promising research initiatives of our faculty, several projects have gained the support of different funding agencies external to UP. An example is the Philippine-California Advanced Research Institute (PCARI) grants which are funded by the government through the Commision on Higher Education (CHED). PCARI supports research projects done by UP in collaboration with the University of California. The PCARI grants focuses on UP research in health innovations and information and communication infrastructure. 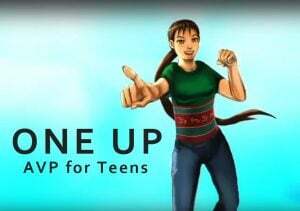 UP is also getting funding support from the USAID STRIDE and UK NEWTON FUND. The USAID-STRIDE is currently funding seven projects under its Collaborative Applied Research with Industry (CARWIN) Cluster and six projects under the Pure Research Cluster. Just two weeks ago, Dr. Concepcion and Dr. Azanza visited Harvard University to explore the possibility of developing programs together as part of our mutual thrust toward internationalization. They were accompanied by some of our campus heads and college deans. Internationalization, as I have mentioned before, is first and foremost an outlook, an attitude that “thinks global” and “acts local.” For UP, our drive for internationalize stems from a sense of nationalism—the same sense of nationalism that drives our teaching and research programs. We view internationalization as a means to enhance our capability to serve our country and people. Through internationalization, we can learn from the best practices of other universities worldwide through enhanced collaboration. Internationalization requires an unshakable sense of self, a genuine appreciation of our unique strengths and the gifts we offer the world, and a clear-eyed view of our own weaknesses. UP as the national university must seek to define and promote a truly Filipino identity and serve the needs of our country. And in turn, we create a distinct Filipino identity or innovation—something truly and proudly ours—that we can banner across the globe as we become a functional part of the greater world we live in. I believe that in the broader sense, this is what we have all come here to do: To showcase our identities and share our gifts, just as we share in the responsibilities of taking care of our common planet. Thank you. I wish you all a fruitful and insightful exchange of ideas.